All WordPress themes have a file called page.php. This is your template file for all pages you have on your blog (remember, pages are distinctly different than posts). The page.php file is your default page template. To create a new one, just open that file in any text editor then “save as” a different file name. In my case, I named the template for my sales pagesignup_page.php. This is a PHP comment. Leave the “Template Name:” in place, but you need to change the name of the page. Once you have done that, upload this new file to your blog theme’s folder. Then, in WordPress, when you go to add or edit a page, scroll way down and you’ll see a setting for “Page Template”. You should see your new page template listed in the dropdown, using the name you entered above. 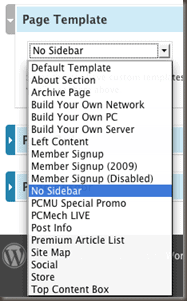 To the right, you can see what my dropdown list looks like in my own WordPress admin panel. I have many different custom page templates in my system, all for different purposes. You can change any other HTML in this file that you want. This would include the file header_new.php from your theme as your header. You would, of course, need to create a file called header_new.php and alter the HTML to make that your new header file for that page. 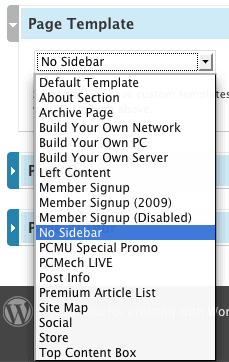 You can do this same thing for your footer or even your sidebar if you want to include a different sidebar. The WordPress template system is insanely customizable once you know how to do it. Above is how I have gone about it for my sales page. I have a custom page set up, and it includes a custom header and custom footer (both with stripped down options). I left the sidebar out. In my case, I even put the HTML for the content of the page into the template itself. Inside of WordPress, the content field is blank. I just selected the custom page template, saved the page, and now my signup page works quite well. Repeat the same basic process for any page of your blog that you want to have a custom appearance. It is so much easier than trying to pack complicated HTML into the editing field of WordPress.